Ironically, however, Oct. 1 also brought a massive domestic failure: the expiration of the 2014 Farm Bill. The president and his revelers, however, never mentioned it during their NAFTA 2.0 victory laps. These yin-and-yang good news/bad news days are common in this era of legislative action/inaction. One minute we’re whooping it up in the name of “our great American farmers” because of a trade deal that’s years from enactment, the next minute we’re hoping no one notices the lack of a Farm Bill that was needed by those same farmers, literally, yesterday. It’s a terrible, disorganized way to operate anything—a farm, a ranch, a government. In fact, farmers and ranchers wouldn’t be operating anything if they farmed and ranched like Congress and the White House governed: promise to deliver something two years from now then not get out of bed for a year. The House then voted to adjourn until after the November mid-term elections when, everyone assumes, the 2018 Farm Bill fight will resume. That’s not a sure bet. If the Democrats, as some polls now show, win the chamber’s majority Nov. 6, they have no incentive to do anything while the calendar and legislative clock both run out on House Republicans, who’ve blocked any movement on the 2018 Farm Bill. More importantly for House Dems—again, if they win the majority—they get control of the Ag Committee to write a 2019 Farm Bill because the draft 2018 bill, if not enacted in the lame duck session, dies with the outgoing ducks. 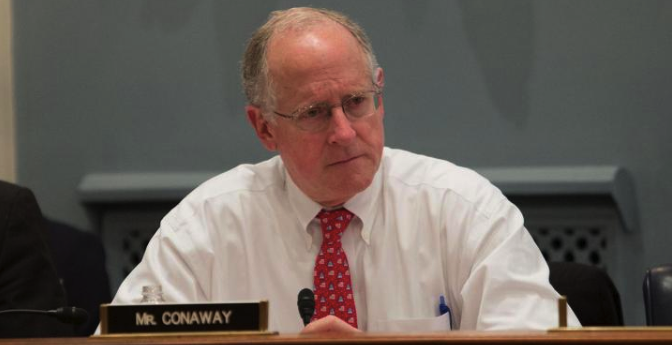 Hmm, “guy” Conaway seems to not know any female farmers, ranchers, or Republicans. “Ashamed of” had to come as a surprise to Kansan Pat Roberts, a fellow Republican and chairman of the Senate Ag Committee, who has repeatedly told Conaway that the bipartisan Senate bill will not be changed to accommodate new, tough—some say mean-spirited—House work requirements for food aid recipients. Roberts’ stance isn’t principled, it’s practical. While he may personally favor the House changes, he also knows no Farm Bill will make it through the Senate if the new rules are part of it. He’s legislating; his House counterpart is campaigning. Despite Conaway’s stubbornness, the wily Roberts has options. First, if voters turn the House blue, Roberts can use the lame duck session to push through an extension of the 2014 Farm Bill until the new Congress is seated. Then, in January, the Senate chair—if the GOP maintains its Senate majority, that is—can begin to write a new, 2019 Farm Bill with the House Dems, a task that many believe will be easier than this year’s boxing match with doctrinaire Conaway. And if the Repubs hold the House? Roberts pushes for a lame duck, Senate-led compromise on the draft 2018 bill by rallying farmers and ranchers to pressure the House to accept it so everyone isn’t forced to start anew in January. It’s a weaker hand but farmers and ranchers—you—are Roberts’ most powerful cards in the hole. And remember, bets can be placed all across the country until the polls close on Election Day.